Perfectly lift your clients’ natural lashes with the CurlPerfect™ Lash Lift. Lash Lift Lotions may be purchased in the CurlPerfect™ Lash Lift Kit, or individually, in boxes of 15 lotions. Refill Perm, Setting, or Nourishing lotions by selecting lotion from the drop-down menu. Tinting is not required when performing a CurlPerfect™ Lash Lift. In the manual we show you at what point in the process you could apply tint, but it is not necessary. Do any of the Curlperfect Lash Lift lotions contain Cyanoacrylate? Lash Lift services do not contain any cyanoacrylate which is the main ingredient in eyelash extension adhesive. If they have reacted to extensions in the past they will most likely be fine with a lift. So happy with the results of the CurlPerfect kit! A client told me her sister thought she had extensions on after a recent CurlPerfect lift! What a compliment to my work and her lashes. I’ve been promoting to my clients that you really don’t know the true potential of your own natural lashes! This is brilliant news, thank you Krista! The product has not failed me!!! 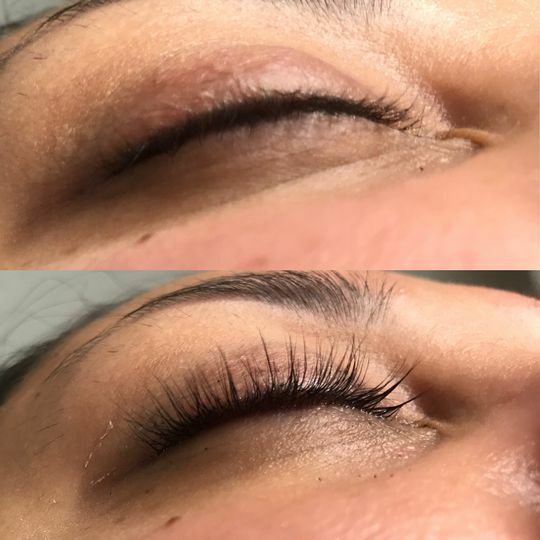 My clients love their lash lifts! Thank you for the love Jamie! Lashes Lifted to the Heavens! I love these products! They are easy to use and always have a great outcome! My clients love their lash lifts! I really like this product, I love the easy 3 step process and the nourish oil packages. The scent is very tolerable and really easy to use even on your self without stinging.